Clutter getting you down? Feel like you are drowning in your own stuff? There comes a time when we all crave a clean and organized space. The trouble is, most of us have way too much stuff crammed in our homes to enjoy a clutter-free abode. So what’s a pack rat to do? Relax! There’s no need to get rid of your treasures. Zippy Shell offers an easy and safe portable storage service to keep those extras safe without having to deal with daily clutter. Is this item worth anything monetarily? Would I feel lost or heartbroken if I lost this item? Do I have a place to store or display this item? Why do I feel the need to keep this item? Once you (honestly) answer these simple questions, you will have a much better idea of what things you need to keep and what it’s OK to get rid of. 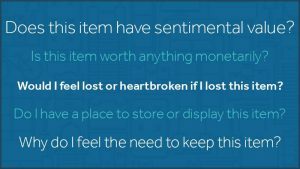 With a pile of “keep” items at the ready, you will now have to decide what stays in your home and what is sent off to storage. The easiest way to decide what to live with is simply to think about the things you can not live without on a daily basis. Holiday decorations, children’s keepsakes, old furniture and seasonal items are all great things to store away from your home. Too many people believe the fallacy that once their items are placed in storage they will never see them again. This is absolutely not true! The wonderful thing about using a portable storage unit is that you pack it yourself (right in your own driveway), in a way that allows you to find the things you want when you need them. Simply label the boxes and stack them in a way that allows you to maneuver through the unit and get what you need fast. It’s just like having a second garage or another basement. To make packing the pod easier, we suggest putting the big stuff in first. Stack heavy items and furniture in the back of the pod, then your boxes and tubs. Leave the front of the Zippy Shell for items that don’t stack as easily, such as bikes, lawn mowers, Christmas trees, etc. Make sure every box is clearly labeled. Using colored tape to mark different categories of stuff — red for holiday decorations, blue for photographs — will make locating items even easier. What Makes Portable Storage Best? Keeping your treasured keepsakes or beloved items in the attic or basement isn’t always the best idea, even if you have the room. Dampness or excessive heat can damage papers, photos, fabric and more. 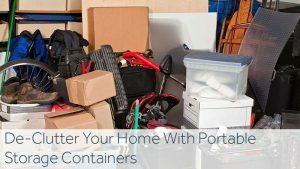 Portable storage units aren’t just convenient, they’re safe. Kept in a safe, climate controlled environment, Zippy Shell Portable storage pods are designed to keep your most beloved items safe from moisture, mold, mildew and theft. Simply fill the pod at your home or apartment, and we will move it to a secure, climate controlled warehouse. When you want access to your belongings, the professionals at Zippy Shell will simply bring it back to your location where you can get into it at your convenience. Zippy Shell is a unique storage option for those who need a place to keep some of their belongings off-site, but who still need access to what is being stored. Fast, convenient and safe, Zippy Shell offers the best in portable storage, with multiple locations and a variety of unit sizes. Whether you have a few items, or need to store an entire house full of belongings, check out our fall special for $40 off the base rate of our standard 8 and 15 foot storage units. Plus, for every six months that you use our storage solutions, you are entitled to a free re-delivery back to your home. This makes taking out seasonal items or simply putting more clutter away a breeze. We also offer a free month of storage to residents who arrange for storage before selling their home.